The first day at school you will be informed about the program of current activities. This course consists of 20 lessons per week in groups of 12 people. During the classes you will improve your listening comprehension, conversation, acquire new vocabulary and also learn the essential aspects of German grammar. Estimated schedule: Monday to Friday, 9.00-12.15 with a break of 15 minutes. Each lesson is 45 minutes..
-Zürich (ZRH): € 135 per person. Please indicate on the booking form from which airport you wish the transfer. In 2019 the school will be closed on the following holidays: 01/01/2019 - 06/01/2019, 19/04/2019, 22/04/2019, 01/05/2019, 30/05/2019, 10/06/2019, 20/06/2019, 03/10/2019, 01/11/2019 and from 23/12/2019 to 06/01/2020. Classes missed due to bank holidays will not be rescheduled or refunded. This course consists of 20 lessons per week in groups of 12 people + 10 classes in a smaller group of 6 people maximum. During the classes you will improve your listening comprehension, conversation, acquire new vocabulary and also learn the essential aspects of German grammar. During mini-group classes, you will have more opportunities to speak and improve your fluency. Estimated schedule: Monday to Friday, 9.00-12.15 with a break of 15 minutes + classes from 13.45 to 15.30. Each lesson is 45 minutes. This course consists of 20 group lessons per week with 5 private lessons per week. During the group classes you will improve your listening comprehension, conversation, acquire new vocabulary and also learn the essential aspects of German grammar. During private lessons, you will have more opportunities to speak, improve your fluency or prepare for a language exam. Estimated time: from Monday to Friday 9.00-12.15 with a 15-minute break. Each lesson is 45 minutes. The Test Daf exam preparation course consists of 20 lessons per week in groups of 12 people maximum. During the classes you will improve all the necessary aspects to successfully pass the exam (listening comprehension, conversation, vocabulary, etc.) as well as practicing exam tests of previous years. The school is an examination center so its teachers are specially trained to teach this type of classes and thus have greater guarantee of success. Estimated hours: from Monday to Friday, 9.00-12.15 with a 15-minute break or from 1:00 PM to 2:00 PM with a 15-minute break. The schedule can not be predetermined before arrival and you will be informed of it at the school. This TELC exam preparation course consists of 20 lessons per week in groups of 12 people maximum. During the classes you will improve all the necessary aspects to successfully pass the exam (listening comprehension, conversation, vocabulary, etc.) as well as practicing exam tests of previous years. The school is an examination center so its teachers are specially trained to teach this type of classes and thus have greater guarantee of success. 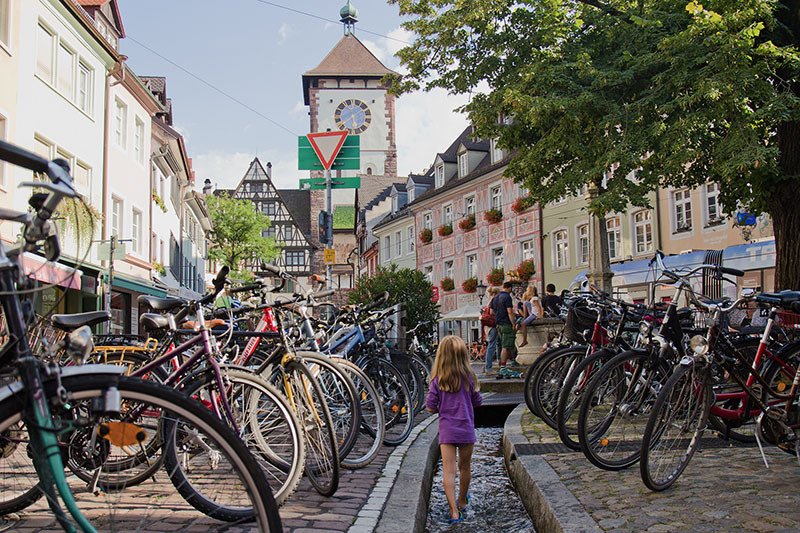 You can book private classes in Freiburg and improve your German with a specialized teacher. During private lessons, you can choose which topics or aspects of the language you want to learn, from conversation to the preparation of an official exam. Staying in a family gives you more opportunities to practice the language. You will stay in a single room with breakfast, half board or full board. Families are about 25 min. approx. in public transport from the school. You will not be able to use the kitchen to prepare your meals. The residence has a total of 14 rooms distributed in 6 different floors. Each room has a private bathroom. There is a shared kitchen, a common student room and a laundry room. Bed linen / towels and WIFI Internet are provided. The residence is about 25 minutes by public transport from the school. This is a very popular and at the same time a quite economical option. You will live with a single person, family or couple who rents a room for students. You will have your own room and you will be able to use the kitchen and bathroom. This type of accommodation is about 25 min. approx. in public transport of the school. It is possible to book this accommodation with breakfast included.